I have recently set up my new 25 gallon tank and have been battling micro bubbles from the return since almost the beginning. I know that there are no bubbles in the final chamber with my return pump but once the water gets to the display tank small bursts of bubbles are released periodically into the tank. I am running a Mag 5 pump that has been plumbed to a 1/2 union and 1/2" barbed fitting. The barbed fitting is connected to 5/8" i.d. clear tubing with a plastic hose clamp. All of these connections are submerged in the final chamber with the water line being at least 4" above the last connection. This the leads to a barbed T fitting that allows me to throttle the output of the pump which I have closed. After this connection it continues up to another barbed T fitting that splits my return into two. These two lines continue up with 5/8" i.d. clear hose until it is connected to another barbed fitting attached to a 1/2" ball valve to control the flow from each return separately. From here the line is plumbed with 1/2" rigid pvc up to my slip-threaded 1/2" bulkhead into my coast to coast overflow. Once inside the overflow box it turn into a 10" run of 1/2" Loc Line up and over the overflow wall into the display tank. and so far it has not eliminated the bubbles. There are still three links of Loc Line that have the top portion exposed to air. I have yet to replace all of this Loc Line with two ridged pvc 90's up and over the weir into the tank. I will try this next but was wondering if my problem may be that the pump is either plumbed with too many valves/unions or inadequate diameter plumbing. I hope this is not the case because the overflow was only drilled to except 1/2" bulkheads for the returns. Do you think the size of pipe could be causing my issues? and if so could I just run larger plumbing up to the bulkhead and adapt it down leaving only the last 10" or so in 1/2" plumbing? Or do you think it is the exposed Loc Line that could be introducing the air. I really would like to solve this problem but as of yet have no solution. I have attached a few images to show the plumbing. If there is anything that needs to be clarified let me know. I forgot one more thing. I have read a lot about the best gph to run through a sump and it seams that this is about 4-6 times. I have a 20 gallon sump on my 25 gallon tank and run about 170-180 gph after head height unions etc. on the Mag 5. Is this enough flow though for my system. My coast to coast overflow runs the entire length of my 24" wide display and has a toothed 1/8" toothed weir. The flow seams fairly slow over the weir but I am getting about 4 times my entire system volume per hour. Do I need to increase this? I ask now because this may affect what I need to do in remedying my bubble problem if I need to up size the return pump. and also replaced and sealed the threaded barb and 1/2" slip to threaded connections on my 1/2" ball valves. I unfortunately still have air bubbles entering my display tank. but it is continuously submerged under 4-6" of water so I can see no way for air to enter the line here. Maybe I am wrong but there appears to be no vortexes forming in the return chamber down to the pump or the 1/2" union and threaded barb connections which are all also submerged. I replaced some of the clear hose tubing and can now see into the line a lot better and have seen no bubbles forming before the 1/2" ball valves. I did notice that when I open and close the ball valves a short stream of larger and micro bubbles is forced out of the Loc Line of my returns. Maybe the air is entering here and these should be removed. You had said before that it is not possible for air to enter into the exposed Loc Line sections so it seams that the ball valve may be the problem. Although I have not seen bubbles forming in the clear lines I did at one point see a few clouds of bubbles being shot from the pump but have not been able to witness this again. Could the 1/2" lines of the output for my Mag 5 be causing cavitation. I don't think so because the input is completely unrestricted and it is my understanding that this is only caused by restricting the input side of a pump. I am at a loss of what to do know. I could remove the ball valves entirely or use all hard plumbing to my dt but this may not solve the problem. If you have any further insight it would be greatly appreciated. he also has been rubbing against plants and rocks. I added some Epsom salt today in hopes that it might relieve him. My 2 tank- bred Ocellaris clowns also seem to be acting strange. They were hiding and both the clowns and the Gramma were not eating as usual, while my Yellow Wrasse and 2 PJ Cardinals are acting normal<ly>. I am concerned that microbubbles could be a problem. My tank is nothing fancy, a 36 gallon bow front with an Aqueon Quiet 30 filter that came with the tank. The bubbles are very small and are not very noticeable but still concern me. Would I benefit from upgrading my filter and a protein skimmer, I plan on adding live rock sometime soon so I feel like an upgrade would be beneficial. Hope you can help. Thanks for all of the terrific information! Have spent many hours looking through a good number of the sections. Just a quick question. I have an All Glasss <Snake tank?> 120gal dual overflow tank currently being setup for a marine tank. Plan to start as a FOWLR and then possibly convert to a reef tank. I built my sump out of a 38gal tank with both overflows coming into a chamber on the left, then flowing into a skimmer chamber with a Bubble Magus NAC 6, then flowing through a bubble trap to a return chamber. There is also a final right side chamber for a refugium that will overflow back into the return chamber. I have two Eheim 1260s (recs from you guys)for my return pumps. When both are running (each returning through one of the overflow compartments) the return is terrific. The problem is it's so good it's extremely loud. I plumbed the returns to the sump so they come in under the sump water level, which helped, but still extremely loud. Also this still gives me quite a bit of micro-bubbles in the main tank. I then tried using one Eheim as the single return pump, with the returns coming off a T connector from the pump. This is much quieter, with significantly less turbulent water flow in the sump, but much less forceful water movement in the main tank. So, my actual question. Is the single pump enough, or should I just use both and deal with the noise. I'm perplexed as I cannot find the source for microbubbles in my 55 gallon tank. I only have 1 IWAKI 30 RLT pump that circulates water up from underneath the tank and through 3 output pipes. I also have an Aqua C EV120 protein skimmer running and it is not a new skimmer. I have also done the soap bubble test on all of my plumbing connections underneath the tank with no air escaping those spots. So, do you think my IWAKI is too strong a pump for my size tank or could it be my skimmer? There is just a constant supply of microbubbles spewing into my tank that I cannot figure out the source? <Lets start by shutting down your skimmer and see if that clears it up. If not, ensure you have no whirlpool effect at the pumps intake and make sure all your hose clamps are tight. Might want to scan through our FAQs on bubble trouble here. Thank you James for your response and taking the time. I try doing what you suggest. <Sounds good Lynne, and do let me know your results. I tried shutting off my EV 120 skimmer and the large bubbles on the front of my aquarium stopped BUT the microbubbles are still coming into my tank. The water coming from the Iwaki pump is exclusively supplying these outputs into the main tank. The Iwaki is a sealed pump with no intake in water so I guess that means there is air getting in the lines somewhere else right? Your thoughts? And if I cannot or do not do anything, are these teeny bubbles really harmful to my 3 fish? I've had my tank running a good 4 years now and they have not harmed my fish yet so is it really worth worrying about? can help you much better if I can actually see your sump and plumbing. I have attached some photos of the underside of my tank. In my 10 gallon sump I have two Mag 5 pumps, one pumps water into the skimmer and one pumps water out of the sump up into the tank. The outlet in the tank from that one Mag pump does not spew out tiny bubbles. However, as best I can tell, the two outputs in my tank powered by the IWAKI green pump are spewing out the tiny bubbles. 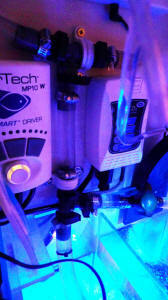 <I see the Iwaki set up and it appears to me that this pump is used for circulation only, likely a closed loop system. The large bubbles in the picture on the inside of the glass are from my skimmer and I'm not sure how to stop those. <Your Mag 5 is likely taking in the bubbles coming out of the skimmer drain. Your sump is really too small to have all this action going on in such a small area. One experiment to try is to put the foam sleeve on the intake of the Mag 5. These pumps are furnished with foam sleeves and a plastic strainer which keeps the foam from collapsing. It should act as a bubble trap although will not be a permanent fix due to the close proximity of the skimmer drain to the pumps intake. If this helps, you may want to separate the skimmer's drain from the return pump by placing a large piece of coarse foam between the two which will act as a bubble trap. Since you have little room in the sump to accomplish this, another alternative would be to mount your EV-120 outside the sump. As long as the highest water level in the sump is below the top of the skimmer box itself, there will be no flood problem. In that regard you can plumb a 90 off the skimmer drain so the return water enters the sump near the opposite end of the tank return pump. I hope the pictures help! I could not reduce my photos with my Comcast email so I hope they still come through! Thanks for all of your time, I sure appreciate it! Thank you so much for your time and great information. I will be sure to try these things. I never thought of putting my EV 120 outside of the sump. I appreciate your thorough answers and not just relaying me to a link on your site! removed, 1 1/2" bulkhead, 8" of 1 1/2" PVC up from the bulkhead with numerous 1/4" holes drilled and a 90 at the end incase of a fish or snail getting sucked in, and bio-balls filled up to the 90. Under the tank is 1 1/2" PVC running straight down with a 45 just below water level, this flows into a filter sock. My sump is a 20 gallon Eshopps reef modified into a refugium with an extra baffle, and a ASM G1x doing the skimming. There is a Rio 2500 running my JBJ Arctica 1/10th chiller with 3/4" I/D tube to a 3/4" bulkhead in the back of the tank 1/3 of the way from the overflow to the other side of the tank. There is also a Little Giant 4-MDQX-SC plumbed with 1" I/D tube (for vibration) from a 1" bulkhead in the side of the sump, out of the pump is also 1" I/D tube to a ball valve and flap style check valve, to a 1" bulkhead on the other 1/3 of the tank. Inside the tank is a 1" Tee and 2 45's for flow direction. Sorry for the long detail but with all of the information I know it will be easier to diagnose my problem. My problem is the noise from the over flow box, micro bubbles, and if I open the ball valve all the way my tank fills before it can drain into the overflow but the water level in the over flow does not rise at all. I have purchased an ABS wye and all of the other pieces for a modified Durso standpipe because I cannot find Flex PVC or a PVC wye at any of my local plumbing or hardware stores that are the right size. Is it ok to use ABS in place of PVC for the standpipe? Is a Durso the best unit for my application? What can I do in regards to the bubbles and flow rate? I just disassembled both of my pumps (return and skimmer) for a thorough cleaning. It hadn't been done in 2.5 years (my bad). Frankly, they didn't look too bad, just a bunch of gunk. They cleaned up nicely and are running well (Blueline pumps are excellent). I've noticed in the past - when I do a really good job of cleaning my equipment - I tend to get micro bubbles in the display tank. Is this common? If so, how long can fish and corals handle the excess O2 in the tank. It's been about 2 days now with some decline in amount - but, if needed I'll take whatever corrective action needed. I have looked thru your website and can't find an issue like mine. I have a 55 gallon reef tank with a 15 gallon sump. I have a mixture of live rock and bio ball in the sump. I have a protein skimmer and a phosphate refractor <contactor?> in the sump, neither one has an air leak. I have an external Iwaki pump returning the water all of the fittings are air tight. 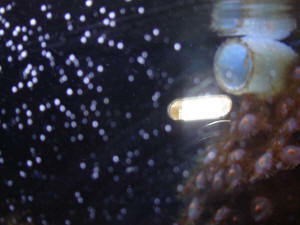 I can see the micro bubbles being generated in the bottom of the intake section of the sump with a flashlight. 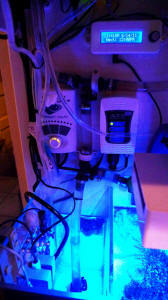 I had this pump system in a 92 corner tank I had, I down sized to this 55 for economic reasons 2 months ago. Everything was working perfectly until this started about 10 days ago. I placed a filter sponge in the bottom of the return tube with no effect at all. Do you have any suggestions or recommend a product I can use to stop this madness? I read the section you directed me to and tried the Vaseline for air leaks, nothing. I took apart the pump and found the front rubber cap and shaft jammed into or glued into the front cover. I could not get it out. Would this affect the pump? I put a new o-ring and put it back on the sump. Still micro bubbles. Could it be to powerful for my tank? Then I spoke to the person whom I got it from and they informed me, they had the same problem with it on a 180 gallon with sump. Would/Could it be a Bad pump?. Would I be better putting the 950 back on? I would like to add a powerhead. Could you tell me, would a 3200 gph be too big? Or should I go with 2 1500 gph? P.S. I have a ball valve on the end of the pump with a 3/4-1" barb on the end of that. Is the 1800 gph too powerful for this reduction that quick? Yeah I think we're on the same page here. The air must be coming in somewhere along the return line connections. I was looking for any signs of salt creep that might indicate a bad connection. but these bubbles are soo small that they are being "sucked" in along the lines from a tiny tiny hole somewhere, probably wouldn't be any salt creep because the inside pressure would not allow it to leak out but only draw in small air instead I'm thinking. Guess I have some tinkering around to do. Will try the replacement pump first since I need a backup anyway and this GenX is pretty noisy, then mess around with connections. I've attached pics of my sump/refuge set up. I can't put a sock on the overflow since the two PVC tubes are connected to the side of the sump. I do, however, use a filter pad -- and as you'll see, I added one more to minimize the splash (I've never needed it in the past). It appears to me (and the pic of the refuge macro algae seems to confirm) that the bubbles could be coming from this source. However, as the water spills into the baffles before being returned to the display tank, the bubbles don't appear to be present. The bubbles in the refuge were my initial concern -- but since they seem to dissipate before getting into the return lines -- I concluded they were not a problem. The pics don't show it well but the there are 2 PVC inside the sump; one for the skimmer (shown in the front) and the other just like it toward the back that feeds the return lines, the chiller, and the refuge. What do you mean by "rapid photosynthesis is occurring there"? I have been running the lights on the refuge 24/7 to prevent the macro algae from going "asexual"
I got "Thee a Fuge"
I have a 130 gal reef tank which has been running 1 year, I took out all the bio balls slowly over a period of 3 months and filled that compartment with live rock, so in total I have about 260 Lbs of rock between the tank, sump & Fuge. 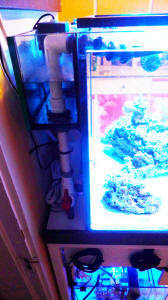 I recently set up a 30 gal tank beside my main tank which I had drilled for inlet & outlet to act as my fuge. I ran a small pump from the sump to the fuge & a siphon hose back into the fuge which runs at a small water flow back into the sump, tried pumping from the main tank but because of the height of the fuge, even when I turn off the pump the water still siphons (obviously not high enough) so I was worried about power outage & you got it major flood, so ran the siphon back into the sump. The siphon hose just goes into the sump was not plumbed into existing lines. So I am getting tiny bubbles coming out of the sump pump into my tank, will plumbing the hose into the return line to the sump help? I have lots of Chaeto in the fuge & pods are going wild, I had to put a Blue Spiny Lobster into the fuge as he has grown quite large since I got him he is about 5" long, I hand feed him frozen krill & squid. What other critters can I put in the fuge as a clean up crew? <See: http://www.wetwebmedia.com/marscavart.htm and the linked files above. Thanks Everybody You guys are awesome!!! Actually my fuge is not siphon fed it is gravity fed so no chance of flood as soon as I turn power off the fuge pump it drains to the level of the fuge outlet. Also thanks for the info on my bubbles used some filter media and it stopped the bubbles. past 2 years. It previously had been attached to a protein skimmer so I had no reason to notice any previous issues. 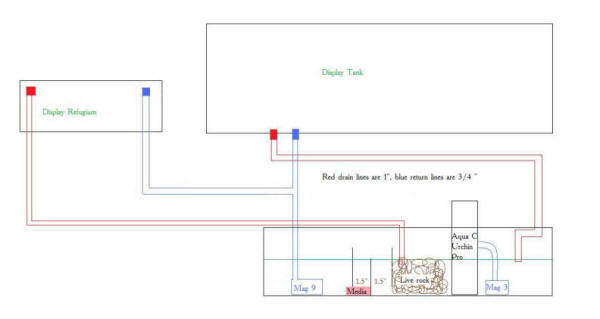 <A few things to check; is the pump completely submerged, the return line from tank is not near the pump intake, no bubbles in the sump, and, no vortex present near the pump intake. I tried to move the pump further from the waterfall and the plumbing came apart and I got an early shower. I've turned everything off while waiting for some help from a local enthusiast. Since the system is only days old I have only live rock, some algae and copepods in the water. I assume all of that will be fine until this problem is resolved. <If you have circulation in the tank by means of a powerhead, you should be fine. Is it possible for you to take a pic of the sump and send to me? Definitive Cause of Microbubbles....? 3/12/09 Hello to the WWM crew, <Hello Steve> We have been designing and installing large aquariums throughout the Northern California Bay Area for a number of years (even with the current economy we are managing to stay busy.... fingers always crossed! ), As we serve largely upscale clients, one of the most common requests is that the system be QUIET (and I mean QUIET!). We have adopted Red Dragon pumps as they are extremely energy-efficient, move a LOT of water, and are almost 100% silent. Amazing beasts these; A problem that comes up seemingly randomly are microbubbles. I have done a TON of research on your site (and just about everywhere else) and find a whole slew of testimonials about fixes but no definitive information about what REALLY causes them. As they are not buoyant, any baffle system is useless (I have observed this personally over many painful hours). I have heard about the possibility of a pinhole leak but in my experience, when one observes a very fine, barely visible stream of whitish "stuff" coming from all the returns, a pinhole leak seems very unlikely. I have used filter socks (which help) and leads me to believe they are formed somehow and somewhere between the overflow into the sump. It also seems that if they are coming into the sump, any mechanical attempt to get rid of them is futile. It seems it would be far smarter to stop them before they form but I cannot understand how this happens. I have a friend who is a civil engineer and very experienced with water flow and is convinced the problem is due to "super-critical" flow, where the water, as it flows vertically via gravity, mixes with air and the chaos of vertical flow (as opposed to a "sloped" flow) creates the problem. We have used Durso's, Gurgle-busters, and it's really quiet but still microbubbles.......AIIIYYYYEEEE!!!! If I had any hair left, I would pull it out! <You are balding:)> Any input? <My thoughts would be...are the Red Dragon pumps submerged in your systems? If not, you may want to remove the end cap and apply silicone lube to the entire "O" ring and also ensure no debris is present on the inner side of the end cap which could cause a pin hole leak in the intake. If they are installed submerged, then this possible fix could be eliminated. I have had a problem such as yours with a new Little Giant pump and lubing the "O" ring cured the problem. More than likely, the problem is coming from the intake somewhere. If a protein skimmer's outlet is near the pump's intake, the pump may be drawing bubbles exiting from the skimmer's return. Are the tank's returns to the sump a good distance away from the pump's intake? Low water level in the sump can create a vortex near the pump's intake causing micro bubble problems, but I'm sure you are well aware of this. Other than what you have read on our site, I can't offer any more suggestions. Hopefully this may be of some help to you. James (Salty Dog)> Steve Steve Bicker, Designer & Owner Nemo Marine Systems, LLC: "Exquisite Aquarium Design"